Hamilton, Canada, January 09, 2019 --(PR.com)-- Canadians in Hamilton and Abbotsford will have an easier way to reach Puerto Vallarta this winter as Swoop, Canada’s leading ultra-low-cost airline, has announced service into Puerto Vallarta’s International Airport (PVR) with the addition of two new routes. British Columbia’s Abbotsford International Airport (YXX) will enjoy twice weekly service beginning January 12, 2019 and Ontario’s John C. Munro Hamilton International Airport (YHM) saw its first flight depart today. and will have service twice weekly. 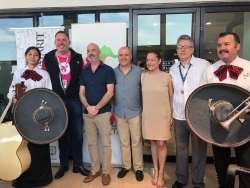 “Puerto Vallarta is a brand-new route for Hamilton International and a very popular destination for Canadians,” said Steven Greenway, President of Swoop. “Combining Swoop’s ultra-low fare with the favorable exchange between the dollar and peso makes the value proposition of exploring Mexico enticing for families and budget travellers vacationers looking to escape the cold winter weather when services begin in January." Puerto Vallarta welcomed its first-ever Sunwing flight from Quebec City’s Jean Lesage International Airport on December 17th; marking the beginning of the tour operator’s seasonal weekly flight service to Puerto Vallarta. Flights will take place every Monday until April 15, 2019. Puerto Vallarta is one of Canadians most popular international vacation destinations. Historically, almost 15% of Puerto Vallarta’s international visitors are Canadians. At the beginning of this year Expedia.ca announced that in their survey of a 1,000 Canadians, Puerto Vallarta was a top recommendation for travel in 2019.